Home ♦ Coffee Shops ♦ De branding Starbucks? Starbucks is testing out a new marketing strategy: make their stores less like Starbucks. Of course, this is simplifying things, but it is more or less what the coffee giant appears to be trying in order to set their stores apart from the competion and return to their coffee-house roots (possibly as opposed to moving more towards a fast food operation). The new venture is in Seattle and is now called 15th Avenue Coffee and Tea. 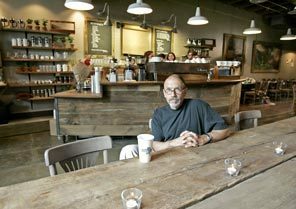 The shop shows no signs of its affiliation with Starbucks (despite having been one not too long ago), and serves beer and wine in addition to planning to host local events like open-mike nights. Baristas will use machines where the shots must be pulled by hand, not by pressing a button. As expected, there are a lot of people who seem to be up-in-arms about the company trying to “fake” being a “local” shop, but the reality is that it isn’t all that different from any other coffee shop opening up in the neighborhood, even if there is a bit more money behind it. Most consumers will probably find it to be a upscale version of a regular Starbucks, good for a more “gourmet” experience, although many Starbucks customers will no-doubt maintain an appreciation for the speed of the traditional model.